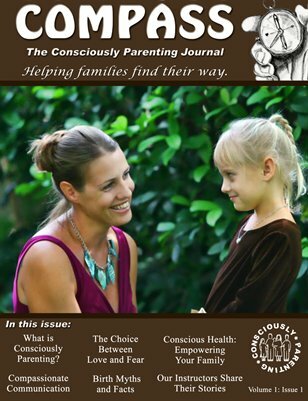 This issue is just the beginning of who we are at The Consciously Parenting Project. Stephanie Bachmann Mattei shares with us her path to Compassionate Communication. We have Suzanne Arms’ first installment of “Birth Myths and Facts” that will continue in the next issue. Kim Griffith shares her insight on health and diet and how to break free of self-defeating cycles in times of need. And these are only a few of the highlights of this issue. We are excited you are here and hope you find in these pages comfort, enlightenment and empathy. Relationship: that is our focus. Whether it be in a state of creation, nurturing or repair, relationship is the best investment for each family member living in joy. We hope in this journal you’ll find the tools and inspiration to enrich your family life.